Uneven gutters, often filled with debris or small mounds of dirt deposited by passing cars and trucks, line the traffic lanes. Cyclists who brave the road dodge potholes and passing cars. Trucks, and most cars, tend to stay in the inside lanes. So in a departure from what many consider the Houston model, the city is calling for less space for cars and trucks. Plans for Dunlavy, along with a handful of other street segments between River Oaks, downtown and U.S. 59 and along the Washington Avenue corridor, will decrease driving room in favor of retaining trees and making parking, bicycling and walking easier. What’s significant, officials said, is the decision to reduce driving lanes in some spots. The traditional Houston method of improving a four-lane road – widening it to five or six lanes – is falling out of favor in many neighborhoods, with residents reluctant to lose more private land to roads. The planning department will host an open house in late June to explain the amendments. Most of the 2014 changes proposed are inside Loop 610, though a handful would create better connections to industrial areas on the east side. Various changes are proposed in newly developed areas on the city’s fringes as well. The City Council is expected to consider the changes in September. In many spots inside Loop 610, developers can expect most traffic to stay on major streets, while some neighborhood routes lose driving lanes to bike lanes and sidewalks. The proposals also reflect more emphasis on so-called “complete streets” policies that encourage planners to consider cyclists and pedestrians in street design. In October, Mayor Annise Parker, by executive order, declared Houston would embrace Complete Streets policies. Residents along Dunlavy, and generally around Neartown, told planners they wanted their streets to allow for biking and walking, rather than widened to accommodate more traffic. In many spots, the new street plans are racing development. At Dunlavy and Alabama, an apartment complex under construction would increase traffic to and from the neighborhood. 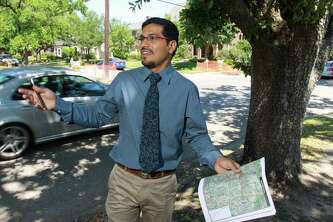 (For the Chronicle/Gary Fountain, May 5, 2014) Amar Mohite, head of Houston’s Transportation Planning Group, takes a look at Dunlavy Street. Houston amends its major thoroughfare plan annually, and Dunlavy is being downsized from a four-lane thoroughfare to a two-lane thoroughfare. This doesn’t mean construction is imminent, but it is one of the first major signs of the city getting Complete Streets planning in place. The idea of narrowing the street is to improve parking and bike-pedestrian options. A lot of sections of streets will get a refresh in the Montrose area in the plan. 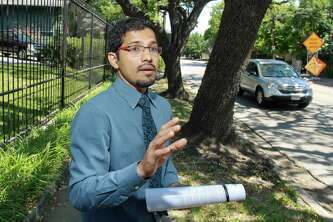 Skeptics say the city is pushing a concept most Houstonians reject and most drivers will regret. “Enjoy the trees when you’re not sitting in traffic,” Upper Kirby resident Steve Willenbrink said of preserving trees and yards instead of widening roads. Supporters of more bike-friendly and pedestrian-accessible streets, meanwhile, applaud the proposals but suggest they should go further. “They are not reality yet, and that’s where they ought to be,” said Tom Dornbusch, president of the Super Neighborhood 22 Council, made up of local civic groups mostly between White Oak Bayou and Buffalo Bayou west of downtown. Houston continues to rank poorly in terms of bike-friendliness and pedestrian safety. Last week, Houston was named the seventh-most dangerous large U.S. city for pedestrians in a report by Smart Growth America, a national anti-sprawl group. Houston was the most dangerous city for pedestrians in Texas, the group found. Dornbusch said many people are hoping for quick, meaningful action.